Mary sat there with her eyes rolling back into her head; her mouth foaming a bit. Her newborn baby was sleeping in her arms while she jostled him each time she would nod out and try to keep focused. I stare blankly. I am new at this, but I can’t let Mary know that. I am just 25 years old, and she is well into her 40′s. She is not new at this, not by along shot. Little does she know it isn’t her newborn I am after, it is her disease. “Do you have any other kids Mary?” I ask, as I fill out her assessment. I clarify for her that people like me what to see her clean, healthy, and safe. After an hour long assessment I learned Mary has been using for more than ten years. She doesn’t even remember how old she was when she started, but she does remember the first time she sold her body for a hit of heroin. She tried rehab too many times to count, and currently she is high on the doctor-prescribed methadone mixed with a hit of heroin. She still thinks I want her baby. She doesn’t know I want her disease. I want Mary to claim war on it. I want her to fight with me. I want her to have the ability to see herself as more then just a drug addict. I want her to see herself not as a prostituting drug whore, but as a loving Mom. It is clear she is an addict, but it is also clear to me she is a loving Mom as well (the baby is swaddled in a blanket, fed, and she is cooing at him. She bathes him in kisses, and opens her diaper bag for a pacifier). That baby deserves his Mother to fight the war. That baby deserves a better life then getting passed around the drug world, because if he stays he will never get out. I really don’t want to take her baby. After a few more meetings and evaluations, Mary refuses my advice to go into family residential treatment. It is the only way for her to keep her newborn son, and for them both to be safe. She isn’t ready for the fight. Her disease is telling her that it is more important then her kids. Her disease is running Mary. Mary isn’t fighting because she hasn’t “hit bottom” or reclaimed the right to her body, her life, her choices. By now I am sure you know the outcome, Mary lost her baby to the state. Her 5th child to the system. 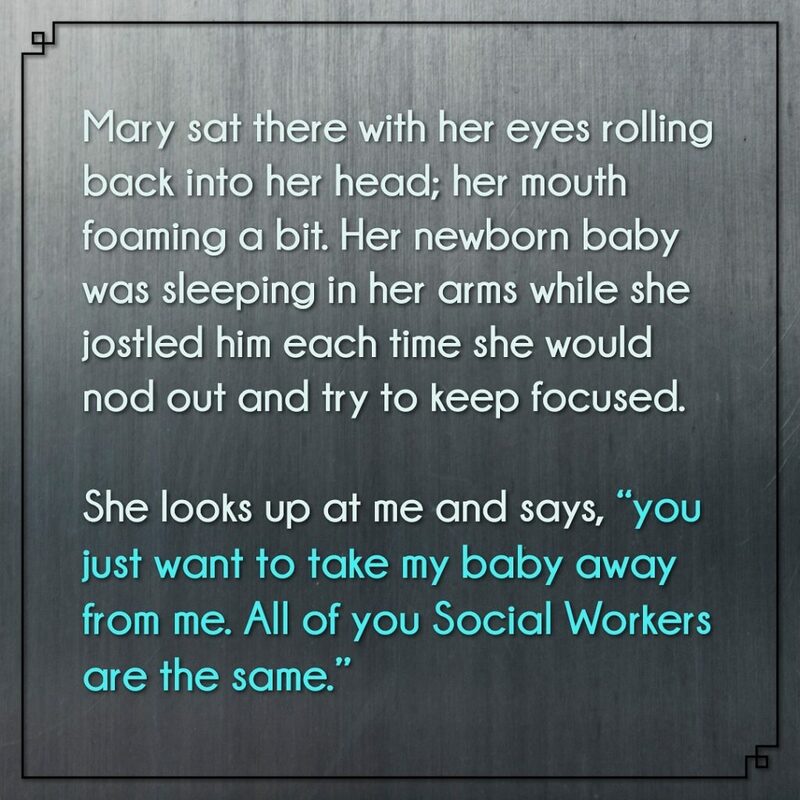 I was just another Social Worker that had to report it. I was, what she said I was, a baby snatcher. I wish I could explain why, but nothing I said comforted her. She refused treatment, and I, ethically, could not let her continue to take care of her 1 month old on the streets she sells herself and buys drugs on. You may be reading this and thinking “I’ll never get this low,” “This isn’t me” “my story is different” or “it hasn’t consumed me” “I have control of it”. Don’t fool yourself, Mary thought all of these things as well. Addiction is all the same disease. It will consume you if you don’t choose to consume it. It will make you give it everything. It can push you to do things you never imagined you be willing to do. It will cost you not only years of your life, but your loved ones. It will take all of who you are, and what makes you “YOU”, and give it a slow and painful death. It is violent, and abusive, and it needs to stop. As a professional in the field of Addiction I can tell you this: You can not do it alone. You shouldn’t have to do it alone. If you needed surgery to remove tumor, do you take the scalpel and do it yourself? No. It is the same thing my friend, the VERY same thing. A disease is a disease is a disease. We (professionals) aren’t here to take your babies. We aren’t here to pass judgment and tell you how bad you are. We didn’t get a degree in this to make fun of you, or to watch you pee in a cup. We did it to help you fight. We are here to reclaim you. I am no longer 25 years old, and I may not be in the business of rehab anymore (instead I am a stay at home, blogging Mom). However, Mary, and all the other people I sat with in various rooms at various locations will always be in my heart. I will always feel like I am a warrior against Addiction. I will always want to win the war, support addicts and their families. And I am here to tell you…. you are not alone with that monster. Don’t let the Addiction win. Reclaim yourself, your life, and what you rightly deserve. Seek help, and fight the war. Thank you for fighting for the people we love. Thank you for your passion and devotion to their well-being even when they aren’t. Thank you. I remember a time when I was a WIC breastfeeding peer counselor and one if the prenatal mom’s I was working with was on methadone and a few weeks or maybe about 2 months from her due date when I first met her. She wanted very badly to breastfeed her newborn. She had heard from another expectant mom on methadone it would help mi her newborn’s withdrawal symptoms. I spent weeks working on a plan with her, we meet with a supportive IBCLC, discussed possible hurdles to success given mom’s long standing case history with drug use it was clear she would need a great deal of support to stay the course. Months of preparation, and thoughtful conversations about sobriety, methadone maintenance, breastfeeding, baby wellness, momma wellness and life in general. We both thought we had it in our sights. She was going to beat the odds and baby would be fine. Hours after giving birth her child’s father brought her heroine to celebrate. A those weeks of hard work were for nothing. Baby was immediately removed from her care. Momma’s demons were too powerful to let her achieve her goals.my heart broke for both mom and baby.